If you ever fish a blackwater river in Eastern North Carolina this time of year, you’ll come across an interesting phenomenon. Bowfin (aka blackfish, dogfish, or grindle) are a prehistoric fish that can survive in hot, oxygen-starved water by inhaling air into a swim bladder that works like a lung. In short, they can breathe if they have to. Pull your boat into any oxbow on a really hot summer day, turn off the motor and sit still. You’ll soon see and hear the bowfin rising to the surface, holding onto life, one gulp at a time. Pull up on Jones Street on a hot day this week. Listen. You’ll hear something similar. Right now in Raleigh a political party is literally running out of time. They’ve seen the polls. They know that their super-majority stranglehold on the legislature may come to an end this fall. The political oxygen they have enjoyed this decade is running low. In response, they’re gasping for power with a series of last minute bills designed to amend the North Carolina Constitution, while there’s still time. A proposal to assure that North Carolinians have the right to use “traditional methods” to hunt, fish and harvest wildlife. Is it “conservative government” to alter 150 years of constitutional tradition? No, it’s not. It’s gulping power. All of this is going to make for a long and tedious ballot for North Carolina voters in the fall. Will they simply rubber stamp all of the amendments with “yes” votes? Who doesn’t like hunting and fishing and lower taxes? That’s what Republicans are hoping for, and they’re probably right. 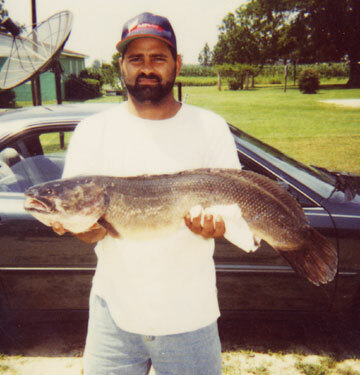 I’ll leave you with the state record bowfin, caught by Gregory Demery, Sr. in the Black River on June 21, 1997. Surprisingly, he was able to use traditional fishing methods and did not need an amendment to the North Carolina Constitution to wet his line that day, only a fishing license. The river’s still there and you can still fish it with traditional means. I tested it last week. No amendment needed. Regardless, this summer, whether you’re in a boat in the bend of a river or a seat in the balcony at the Legislative Building, you’ll see a pool of fish taking big gasps of air, trying to hold on. « Do Downtown Stadiums Create New Growth?